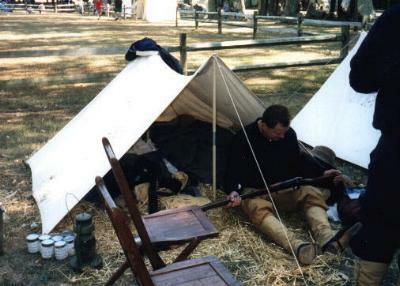 The 1999 Annual "Muster on the Maumee,"
In the setting of a restored 1812 Fort Site is the annual "Muster on the Maumee," at Ft. Meigs. Inside the walled stockade is 10 acres of area for troops to make camp. This is augmented by 7 blockhouses, visitors will find large earthworks separating each camp. Among the nine Spanish American War living historians present were Randy Raper, Barry Hamper, and myself. 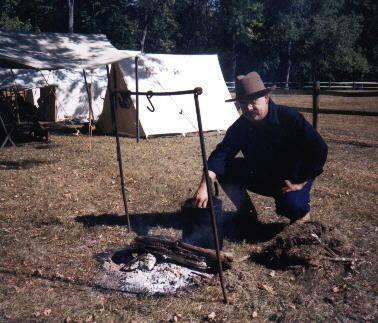 Here we practiced period Bayonet Drill, and practiced the art of making "Santiago Stew." A fine time for all as we enjoyed the company of other re-enactors who displayed a time line from 1600 to the present. The Patton Museum at Fort Knox, KY is the site a great World War Two event every year. In 1999 a time line was added honoring the American Soldier from 1775 to 1999. The participants were asked to exhibit their clothing, equipment, and weapons for the public. The evolution of individual weapons was interesting to see for sure. The tour of the Patton Museum was certainly worth the drive all in itself. You might want to mark on your calendars for next year as this is an annual event occurs every 4th of July. The last weekend in September each year is the event at Ft. St. Clair. Held on the site of a 1795 era fort which is now a beautifully wooded park setting. Here the hosts treat the Living Historians as Royalty. All participants are given a wounderous Saturday evening meal, "invasion money" which can be used at the numerous food vendors present and a medallion commemorating the event. Sunday afternoon of the second day event features a Spanish American war Battle complete with period correct breast works, ground charges and artillery pieces on each side. A large contingent of Spanish Troops are present to give the U.S. Forces a real go. This is an excellent event for the families too. C-Company turns out in force for this event.